Lock in a great price for YOLO Guesthouse - rated 8.8 by recent guests. Breakfast contains egg, fruit, juice, bread, cheese, sausage, jam which is enough to start the day. Location is very good near the shopping area, though far enough to have a quiet night sleep. Parents of manager are very friendly as well as the foreign support staff. Great location just a short distance from the busy bustle of Myeongdong shopping and food area. It's so convenient to go sightseeing as the metro station is just nearby. The staffs were very friendly and the rooms are equipped with sufficient facilities. Myeongdong Station (Exit 3) is just 3 minutes away from the guesthouse (in walking distance), it's very convenient to reach other attraction places from myeongdong station. Not to mention, Myeongdong Shopping Streets is located just a few buildings away from the guesthouse! You can just walk there. They also provide a continental breakfast (toast, boiled egg, fruits, juice and coffee) every morning for free <3 I'd like to thank all the staffs for their hospitality, me and my family had a very great time during our visit! If the owner could improve his politeness, that will be much better. I like the convenience and safe environment with all the amenities that any traveller would need. Located a 4-minute walk away from the lively Myeongdong shopping area and Exit 3 of Myeongdong Subway Station (Line 4), YOLO Guesthouse features free WiFi in all rooms and free parking off site. All rooms come with a flat-screen TV with cable channels and air conditioning. Private bathrooms include a hairdryer and free toiletries. YOLO Guesthouse offers safety deposit box and luggage storage services. Guest may use the computer and fax/photocopying at the shared lounge. An American-style breakfast is provided at the property. From YOLO Guesthouse, Namsan Cable Car is a 7-minute walk away. Incheon International Airport is within a 70-minute drive from the property. 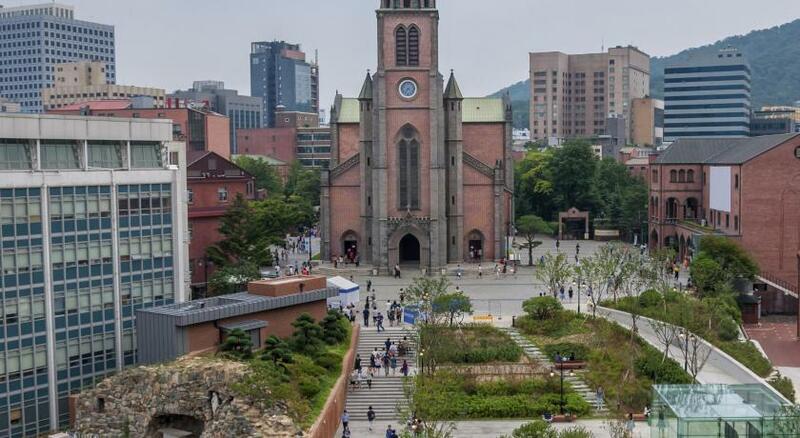 Jung-Gu is a great choice for travellers interested in shopping for cosmetics, shopping and shopping for clothes. YOLO Guesthouse has been welcoming Booking.com guests since 27 Jan 2017. When would you like to stay at YOLO Guesthouse? Property surroundings – This neighbourhood is a great choice for travellers interested in shopping for cosmetics, shopping and shopping for clothes – Check location Excellent location - show map Guests loved walking around the neighbourhood! House rules YOLO Guesthouse takes special requests - add in the next step! One child under 6 years is charged KRW 10000 per night when using existing beds. All children under 6 years are charged KRW 25000 per night for extra beds. All further older children or adults are charged KRW 25000 per night for extra beds. YOLO Guesthouse accepts these cards and reserves the right to temporarily hold an amount prior to arrival. 1. Small space for family room. 2. Towel is too small. 3. Small space for having breakfast and no facility for easy cooking. Very good location and comfortable bed. The manager is not a nice person. No greeting in the morning or good explanation of the room nor any tourist information. At arrival you have to sign a contract making you liable for any damage. Better to check the room well as you get otherwise accused of damage you were not aware of. Bed contain synthetic sheets and some of the beds are very hard. No cleaning of the room during the stay! Lots of communication issues. I think that outsource the shuttle service from a different company. Was actually overpriced and not told about the reservation process until we landed. They originally responded to our messages within a few hours, but once the shuttle became an issue they were not responsive. I had to get my Korean friend to call the hostel and shuttle service on our behalf. They didn't cancel the shuttle and the driver never held up a sign for us even when the hostel said they would. The driver also didn't speak any English and the hostel staff didn't even know the driver's name or anything. When the staff asked us to pay the driver in cash-only, they were being very rude and aggressive. Also, our room was on the 2nd floor. We had to climb up and down a huge outdoor staircase (no elevators). The outlets were also sideways for some reason, so it was very hard to plug in things that needed a converter. A lot of times, the plugs would fall off. The staff was pretty friendly and helpful at times. 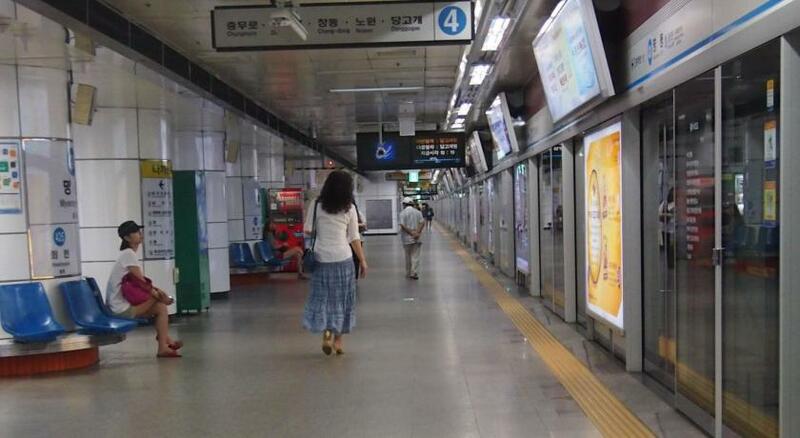 It's also a short 4-minute walk to Myeongdong Station. It's also across a convenience store and it was close to a lot of restaurants. I love everything in the hotel. The staffs are kind and helpful. There is no kettle in the room. For hot water we need to go over to the main building next door and need to press the bell for someone to open the door. Poor Breakfast, dirty room, no elevator, limited towels . I stayed for 3 nights but they didn’t clean even once. The loft was ridiculous to get into, ceiling is right at your head so you either have to crawl or slide on your backside. Also very hot up there as no air circulates. Bathroom was difficult to shower due to size. Breakfast was passable. Would like a bit of variety and cream for the coffee (not powder). Owners son was quite rude to us. Each time we asked a question we felt like we were interrupting him surfing the Internet. The owner couple were very pleasant and helpful, too bad they are not available in the evening. Excellent location. A few minutes walk from Myeongdong shopping and subway station. Many shops and restaurants near by. Room was a good value for the location. Owners were quite pleasant and helpful. Room is a little tight, but if you just need a place to lay your head after a full day of sightseeing, this will not be an issue for you. The location is unbeatable! 5 min walk to the metro and/or the Myeongdong markets. The room was cozy and clean. The staff were extremely helpful and freindly. Location is the only main point that I like about Yolo. For the direction; Myeongdong Station Exit 3; turn left hand side; will see 7-11 and walk straight until Pacific Hotel and choose left lane then walk until mini 24 convenient store on right hand side and then walk into that alley upto the hill and will see Yolo on the right hand!